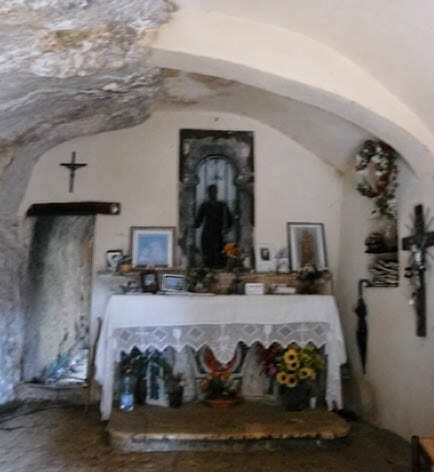 Abruzzo’s most famous rock face hermitage, dedicated to San Bartolomeo in Legio and just outside the town of Roccamorice, is a wonder. We decided to do the 45 minute hike to walk off our traditional fat ferragosto feast after being put off on our last attempt bleak mid-winter… hermits, monks and pilgrims had a lot more icy tenacity in days gone by than we do, even, with our high tech walking boots! St Bartholomew, for those that don’t know (we didn’t), is famous in the Catholic Church as a miracle worker protecting and curing convulsions, headaches, paralysis and mental health problems. He’s normally depicted with a knife as, according to who you believe, he was flayed and crucified upside down in Armenia where he’d gone to preach from Syria; others say he was beheaded, perhaps that’s why he’s the patron saint of butchers and tanners. We followed signposts up from one of my very favourite Abruzzo mountain towns, Roccamorice in Pescara province, which takes you up a wide mule track; this is a bit rough in places and you can park either just before this track or there are a couple of spots off the side depending on how far you are comfortable driving. The appropriate “C1 Majella Walk” signposts are easy to spot. As Noel from AboutAbruzzo said in his post, the flora & fauna make this an incredible, mostly shaded walk. There is one stretch in which you stride through a giant fern field, without shade but which is somehow incredibly cooling, perhaps that is why it seemed a congregation of humming bird moths accompanied us along the path, I counted 5 butterfly varieties along the way with numerous birds of prey utilising the mountain air currents for an easy dinner. 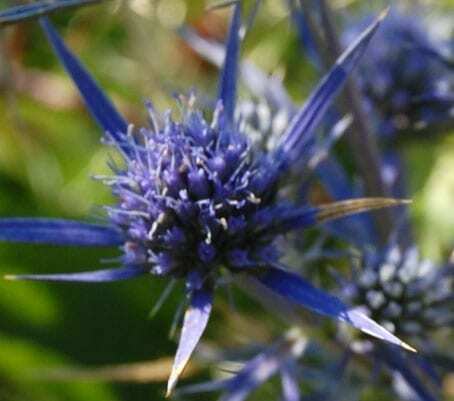 Silver blue eryngiums lined our walk and it would be wonderful to undertake it in May with Abruzzo’s more baroque flowers as company. 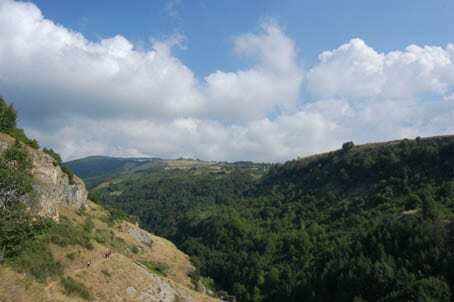 The vistas up to Blockhaus, the abundant wildflower meadows and pastures of the Valle di San Bartolomeo, known also as the Valley of the Holy Spirit, and in the distance the Gran Sasso Range all combine for perhaps one of Abruzzo’s most inspiring easier walks. It’s a family favourite judging by the numbers of multi-generation families making their sacred pilgrimage. We managed with an 11 month old baby in a carrier and our mad spaniel. 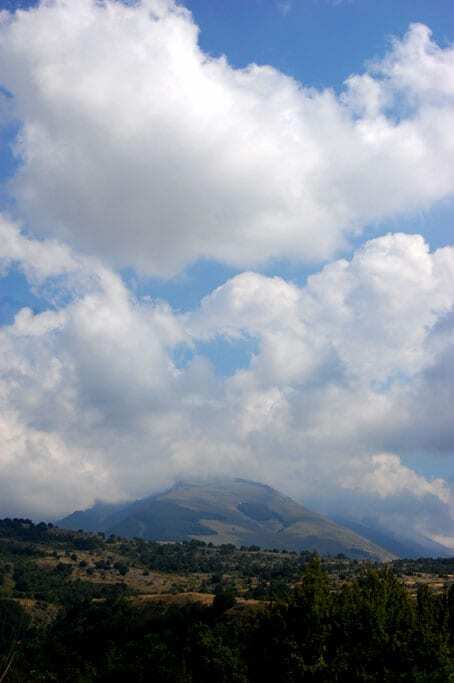 It was funny along the path to hear an American Italian couple being escorted by their Abruzzesi cousins to see this Abruzzo rock wonder; they may not have had much Italian but they certainly could ask for just a 2 minute rest please! 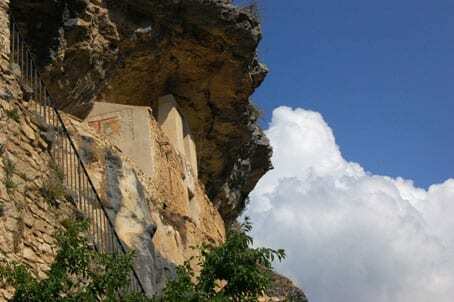 You descend down into the 600 metres above sea level hermitage using the ‘Holy Ladder’, a vertical 26-step carved stone staircase that apparently was previously exited by genuflection. That’s one for the more flexible and devout pilgrims I’d say these days, I didn’t see any on the day we visited exiting semi-prostrated though some were a bit bent over from heat exhaustion. 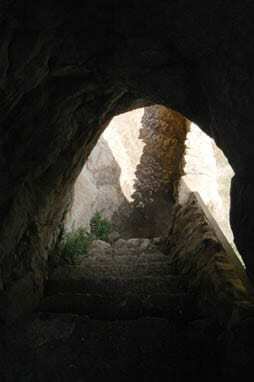 At the bottom of the staircase you feel as if you’ve been caught serenely between rock lips and the bench donated by a Canadian lady, it is really rather lovely to catch your breath before entering the three room little church itself. There’s a lovely Medieval fresco above the wooden door that dates back to the time of the Abruzzese Pope, Celestino V, who was a hermit here between 1274-1274 and rebuilt the church in the late C13th before he rejected and resigned his pontiff as a protest of the corruption in the church in Rome at the time. The church itself is wonderful, dimly lit, small, simple with a lovely meditative quality. It’s easy to understand why it’s said the followers of Celestine and their paths of silence found this a spiritually awakening place. 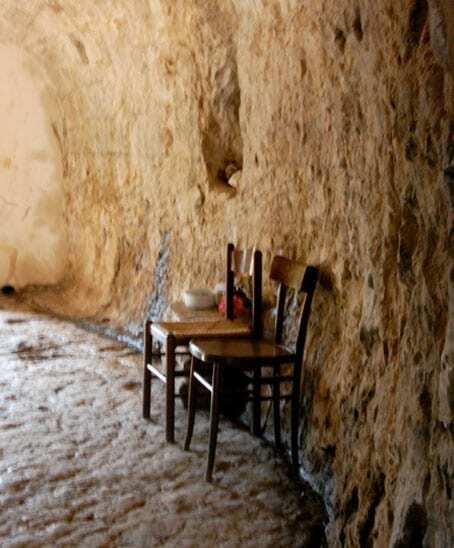 For believers there is a holy restorative spring on the left with a small ladle to drink from, a simple altar and a wooden statue of San Bartolomeo with a book to sign and make offerings as you wish. San Bartolomeo is taken by procession down to Roccamorice after an early mass on the 25 August in early celebration of his Saint Day for the town’s 3-day festa. He remains temporarily in-situ until September 9 when there is a procession back to the hermitage.